Moara Pigs, also known as Estrela, Estrelense, Mouro, and Pereira Pigs, are from Duroc, Canastra and Canastrao in southern Brazil. They are usually blue roan, but occasionally red roan. Moura Pigs are considered tough and strong. 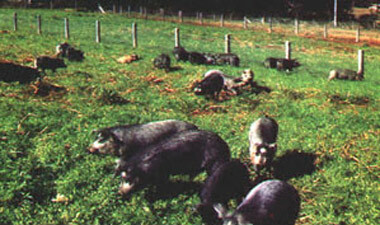 Moura Pigs adapts easily to changes in the environment. Though stubborn, Moura Pigs are manageable and survives on little food, plus they are disease resistant. All of this makes them well suited to the small households south Brazil.